While Hawker Aircraft Ltd. was introducing their Sea Fury prop-driven naval fighter in 1944, they began to consider how to apply the new jet-engine technology to the Fury design. Rolls-Royce had just introduced a new engine, the B.41 (to be named the Nene), that had adequate thrust to propel the big Fury airframe, and in November of 1944, Hawker provided a preliminary concept of a B.41-powered Fury to the British government, with the designation P.1035. The design team, working under Sir Sydney Camm, removed the Centaurus radial engine from the nose of the Fury, moved the bubble canopy as far forward as possible, and put the Rolls engine in the middle of the aircraft, with intakes alongside the fuselage and exhaust as a tailpipe going straight out the back. After a little more thought, the Hawker engineers came up with a follow-on proposal, designated the P.1040, in December, 1944; the new design had a major refinement in that the straight tailpipe was replaced with a split tailpipe, with each outlet in the wing root; this scheme meant the wing root had to be thickened, and so the intakes were placed in the wing roots as well. This layout reduced the amount of ducting and allowed fuel to be stored both fore and aft of the engine, preserving the aircraft's center of gravity as fuel was consumed. Avoiding having a long tailpipe also meant avoiding any thrust loss effects which were keenly felt on the earlier lower powered jet engine designs. The Fury's distinctive elliptical wing was abandoned for one with straight edges (to simplify manufacturing) and the tailplane was raised to allow it to clear the jet exhaust. The new design also had tricycle landing gear - the first Hawker aircraft to do so; it no longer looked very much like a Fury. Armament was specified as four 20-mm Hispano Mark 5 cannon. The P.1040 was intended for RAF use. Government interest, however, was mild; the war would clearly be over before long, and both the RAF and the Royal Navy had other jet fighter designs either flying or in the works. Nonetheless, despite the end of the war, in October 1945 Camm ordered the construction of a prototype. By this time, RAF interest had disappeared completely - their air planners believed that their latest Meteors would be the hottest thing in the air for the foreseeable future - and Hawker Aircraft, faced with massive cancellations of orders for their prop fighters, hastily modified the P.1040 design for carrier operation and submitted the proposal to naval planners in January, 1946. VP422, the second prototype; Cyril Peckham, Hawker Aircraft Ltd.
Much to Hawker's relief, the Navy was impressed with the design and ordered three prototypes and a test item; Hawker completed the prototype already in progress to provide the initial aircraft and quickly constructed the others. Camm's engineers then proceeded to refine the P.1040's design as a carrier-based interceptor - as well as to consider what could be done with the design to get the RAF interested again. This effort led to a number of other designs including a swept wing version (the P.1052), a rocket engined version (the P.1072) and a swept wing version with the jetpipe exiting at the end of the fuselage (the P.1081, destined for Australian use but cancelled in 1950). The P.1081 would however be the precursor of the extremely successful Hunter. The first prototype flew on 2 September, 1947; the project was announced to the public a month later, disguised for some forgotten reason as a purely company-financed effort. This pretense was dropped when the second prototype flew a year later, on 3 September, 1948: it had folding wings, a stinger-type arresting hook, and was fully armed. This second prototype was used in carrier trials that indicated a need for a slightly longer wingspan and arresting hook. 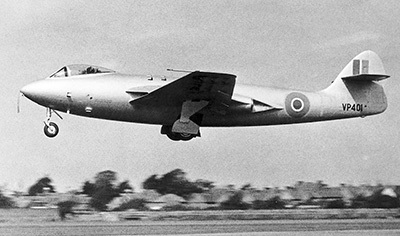 The third prototype took to the air on 17 October, 1949; it was essentially a fully-functional production prototype, with longer arresting hook, provisions for rocket assisted take-off gear (RATOG) and attachment points for drop tanks. The powerplant was the Rolls Nene 101, providing 2270 kilograms (5000 pounds) of thrust. 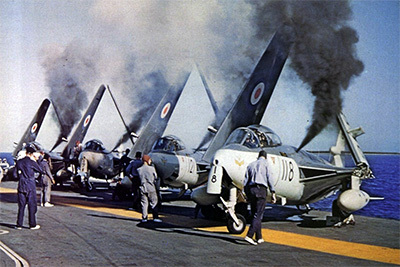 Service trials proved successful, and on 22 November 1949, the Royal Navy ordered 151 examples of the new aircraft, now formally known as the Sea Hawk. 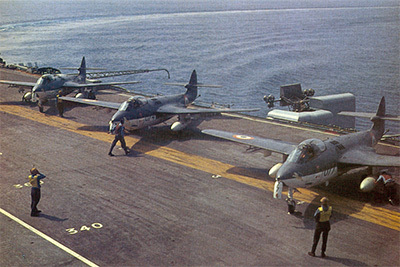 The initial batch of 35 Sea Hawk F.1s was partly used for further service trials (one of which ended disastrously when the folding wings unlocked on take-off) and to provide the first examples actually delivered to Naval squadrons (806 NAS receiving the first nine aircraft in March 1953). 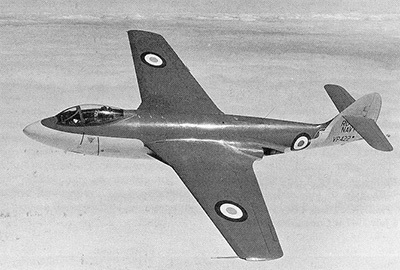 When Winston Churchill had become Prime Minister again in 1951, he had initiated a "Super-Priority" scheme to speed the production of certain critical aircraft, and the Sea Hawk was one of them. The end result was that manufacturing was relocated to Armstrong Whitworth Aircraft (another member of the Hawker Siddeley group). AWA built 60 more F.1s. Pilots had noticed a tendency for the ailerons to go into oscillation, and to fix this problem the Sea Hawk F.2 was produced, providing power-actuated ailerons and a few other small improvements. 40 were built. The next variant, the Sea Hawk FB.3 (Fighter Bomber), first flew in March of 1954 and incorporated a strengthened wing that could be configured to carry a variety of stores; test configurations included carriage of two 500 pound (225-kilogram) bombs and dual drop tanks; 20 7.62-centimeter rockets (each with a 27-kilogram warhead); and other combinations of bombs, rockets, and mines. 116 FB.3s were built, but the Royal Navy had been so overloaded by their Korean War commitments that they were unable to qualify most of these aircraft for full use of stores. Despite this embarrassing situation, an improved strike variant, the Sea Hawk FGA.4 (Fighter Ground Attack) was first flown in August, 1954, and 97 would be built in all. By 1954, however, other nations were beginning to field aircraft that could break the sound barrier in level flight, and the performance of the Sea Hawk was beginning to become a concern. The Rolls-Royce Nene was a centrifugal flow engine, and it had become obvious by that time that this was a technological dead end - with the axial flow engine being the way of the future. This imposed a limit to the ultimate performance that could be expected from the Sea Hawk, but some improvements were still possible; when the 5200-pound (2460-kilogram) thrust Nene 103 became available, about 50 FB.3s and some FB.4s were re-engined with the Nene 103, becoming known as Sea Hawk FB.5s. The increase in thrust was too modest to noticeably increase the aircraft's top speed, but it did provide an additional margin of safety for flight-deck operations. The new Nene 103 was also engineered into new production Sea Hawks, these new machines being designated the FGA.6. 87 were built. The type would soon see action alongside some FB.3s, providing close air support for the Anglo-French Suez operation in November, 1957. During Operation Musketeer, as the operation was known in the UK, 800, 802, 804, 810, 897 and 899 NAS aircraft were embarked on the carriers HMS Albion, HMS Bulwark and HMS Eagle. The Sea Hawks delivered the weapons that the RAF's new Hunters (based at Cyprus) did not have the range to deliver, attacking airfields, railways and anti-aircraft sites. Heavy groundfire resulted in the loss of two Sea Hawks and several returned with damage, but the aircraft acquitted itself well. It would not be the last time the Sea Hawk drew blood, but it would be the last time it saw action in UK service. Also in 1956, 22 Sea Hawks were ordered by the Dutch to operate with the Naval Air Service (Marine Luchtvaartdienst - MLD), to be paid for with NATO funds; these machines were almost identical to FGA.6 aircraft, but had a Philips UHF radio and were designated as FGA.50s. Operated by 860 and 3 Squadrons, most of these aircraft were later modified to carry a pair of Philco Sidewinder 1A air-to-air missiles. At about the same time, the German Navy (Bundesmarine) placed an order for 64 Sea Hawks, with the order evenly split between day fighters and foul-weather/reconnaissance fighters; the machines delivered were also basically FGA.6 aircraft, but with a taller vertical tailplane. The day fighters were designated Mark 100; the Mark 101 was similar but carried a large radar pod on one of the underwing pylons. In UK service, the Sea Hawk was on the verge of obsolescence with the new Supermarine Scimitar slated to be the replacement along with the de Havilland Sea Vixen. Phasing-out of the Sea Hawk began in 1958. By 1960, it had been completely removed from first-line service in the UK. The last production Sea Hawks were 14 FGA.6 aircraft, delivered in 1961 to the Indian Navy; the Indians had ordered 24 Sea Hawks. Split half and half between new-build FGA.6s and converted FB.3s, the Indians were impressed enough to later buy a further 22 Sea Hawks (a mixture of FGA.4 and FGA.6s). In Dutch service the Sea Hawk lasted until 23rd October 1964 when the final example was withdrawn from use. The Germans retired theirs the next year, and 28 of their machines were acquired by the Indians who were obviously still impressed with the type! The Indians would continue to operate their Sea Hawks for a much longer period of time, with the result that they were still operational when the Indo-Pakistan war of 1971 flared up. On the day of the Pakistani attacks against Indian airfields that started the war, India's carrier, the INS Vikrant, had one boiler out of action which reduced her speed and manouevrability. Despite this and an attempted submarine attack she sailed for the major Pakistani port of Chittagong. On the 4th of December 1971, Sea Hawks from the Vikrant attacked Cox's Bazaar and Chittagong. Further attacks against other nearby harbours followed the next day, then Chittagong was attacked once more. For no losses, the Sea Hawks left a scene of devastation with the Pakistani port and its nearby airfield wrecked; thus the Sea Hawk played its part in the Indian victory. Five years later the Sea Hawk was still in service and on the 4th of March 1976, Cdr. Peter Debras had the misfortune to launched off the Vikrant when the catapult malfunctioned. The aircraft ditched in the sea ahead of the carrier and sank. Unable to stop or turn, the carrier passed over the sinking aircraft and Cdr. Debras waited in his seat until the carrier had passed before ejecting. He survived and set a world record for the deepest underwater ejection! The ageing Sea Hawks continued to serve until the early 1980s, when these old aircraft were finally replaced by Sea Harriers - another Hawker design of course. The Sea Hawk, conceived in 1944, with last production in 1961 and serving until the early 1980s was in European terms a most successful aircraft - a production run of 524 and export success to three countries. It would be one of the last major export successes before politics nearly wrecked the UK aircraft industry. 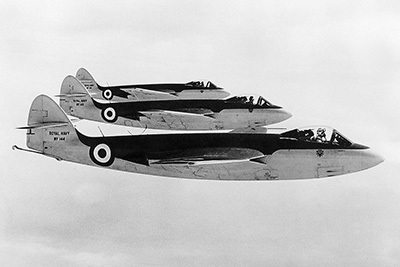 The Sea Hawk's clean and elegant design would eventually evolve into the Hawker Hunter, one of the major fighters of the 1950s onward, and an even bigger export success. Despite their simplicity and large production run, just a single Sea Hawk remained in airworthy condition after their retirement, the Royal Navy Historic Flight's FGA.6 WV908. Sadly after an engine overhaul in 2010 she has yet to return to the air and in early 2016 was placed in storage pending a future decision on whether to get her flying again. 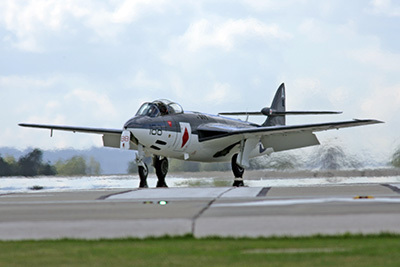 This history is largely based on Greg Goebel's Sea Hawk document from his Air Vectors series. 2 Sep 1947 14 Nov 1951 F.2? Mar 1953 Aug 1954 FB.5? FGA.6? 50? 100? 101?